This chapter emerged from experiences gathered over a period of almost 10 years of working as a computational epidemiologist. The author spent time in 2011 and 2012 as a research fellow at the Etisalat BT Innovation Center (EBTIC) in Abu Dhabi, serving the local health authorities (HAAD), and some of the work reported on in this chapter was carried out at EBTIC, where Benjamin Hirsch led the work. Two keynotes at specialist conferences and a short presentation at a Social-IST meeting in 2013 generated a lot of comments and questions, some of which have been included here. The section on MRSA benefited considerably from illustrations and text from the co-authors of an earlier short paper: Asim Ghaffar, Fredrik Liljeros, and Mikael Stenhem. Some of the ideas in this chapter have also been used for research applications over the years, and some of the formulations here were in connection with this improved by SICS colleagues Anders Holst, Björn Bjurling, Markus Bylund, Pedro Sanches, Baki Cakici, and Daniel Gillblad. Baki Cakici provided the author with important comments on earlier sketches of this chapter. 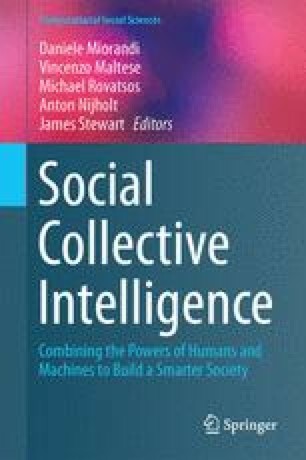 Last but not least, the author wishes to express his sincere thanks to Daniele Miorandi for generously sharing his insights on social collective intelligence.